Sometimes in the heat of the debate, a candidate might misspeak. Perhaps that could explain some of the less coherent comments Donald Trump made in the first presidential debate Monday night. But there's one thing that, according to his advisor, Republican Sen. Jeff Sessions of Alabama, that he got right. Even though a court decision says the opposite. Sessions backed up Trump's claims that stop-and-frisk is constitutional, saying to Bustle, "It's all about how that is done." If you're not familiar, stop-and-frisk was a policy implemented in New York City under Rudy Giuliani's police commissioner William Bratton. It is supposed to be a brief pat-down when someone is suspected of a crime. Instead in New York City, large numbers of people in high crime areas were searched. That resulted in a very high percentage of those stopped — about 87 percent — being black or Latino. Opponents called it racial profiling, and a district court found the practice unconstitutional on the basis of racial discrimination. No, you’re wrong. It went before a judge who was a very against police judge. It was taken away from her and our mayor, our new mayor, refused to go forward with the case. They would have won an appeal. It seems Sen. 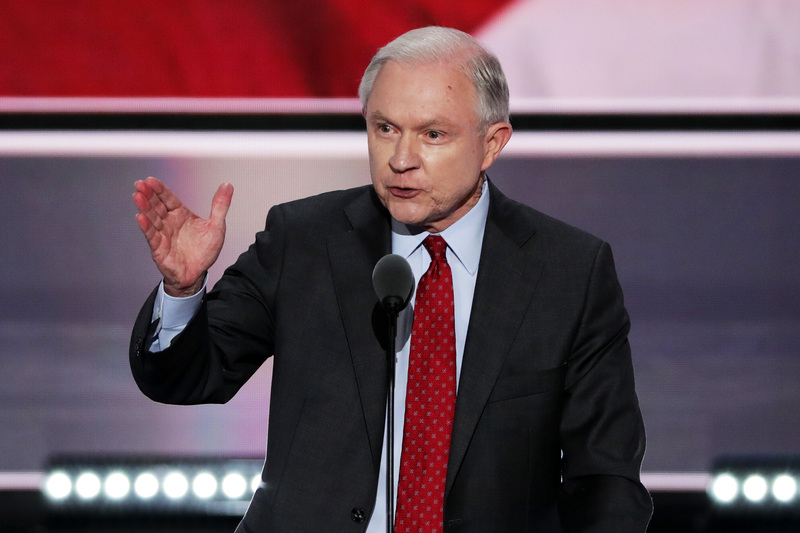 Sessions, a Trump adviser and the Republican who called Trump's name for nomination at the convention, would largely agree with his candidate on the matter. In an interview after Monday night's debate, he mentioned his years as a U.S. attorney for his insight into the matter. He never joined the judiciary, though, because the Senate had concerns about his racial bias. He tells Bustle about stop-and-frisk: "Look, it’s all about how that is done, in my opinion. You’ve gotta be careful to what you do to a citizen on the street. I was a prosecutor, U.S. attorney, for 12 years, so I know the delicateness of it. You have to be careful." He went on to reiterate that the policies were developed under Giuliani to fight "squeegee guys," people that would wash the windows of stopped cars in NYC and then demand payment. He pointed to the broken windows policing policy in which little crimes are not tolerated in an effort to improve communities and gave it credit for the reduction in violent crimes in New York City. But violent crime has continued to decrease in NYC, even after stop-and-frisk was phased out. However, Trump noted at the debate that nationwide murders were up. That brings the question, was it stop-and-frisk or something else that was the reason? Sessions is sure it was stop-and-frisk: "This was a tremendous accomplishment in reducing crime. It has happened all over America. So, the idea that this philosophy of policing should be abandoned by Hillary Clinton and Barack Obama is just ludicrous. It is going to cause deaths and mostly for our minority citizens and the poor." And as for the unconstitutionality, Sessions said Trump was pointing out that "mayor [de Blasio] did not take the case up on appeal" and it was the district court that ruled the practice "unconstitutional." Then he went on to say there's the chance it could "properly conducted," but "if it is consistently improperly conducted, a court might find that violates the Constitution." Sessions may get a bit more of the nuance than Trump, but he's still a big fan of this failed policy that was found to racially profile New Yorkers.